When Tom Perini, a legendary Heisman Trophy winner turned criminal lawyer, is found brutally murdered in Central Park, his widow Julie Perini suspects a wider conspiracy. Not only was her husband part of the defense team for a Congressman on trial for bribery, her intuition also tells her that the FBI is not too eager to find the killer. Relying on her skills as a journalist, Julie begins her own investigation and soon discovers her late husband’s secret underworld associations; ties that now threaten her and her toddler’s lives. Fighting grief and a sense of betrayal, Julie is pulled into an inescapable labyrinth of organized crime dealings, political corruption, brutal power grabs and murder. Desperate, Julie turns to Vincent Sorrentino, Tom’s defense partner, for help, and the two discover a shocking and terrifying truth that threatens to paralyze them. But it may also hold the key—the only key—to saving the lives of Julie and her daughter. 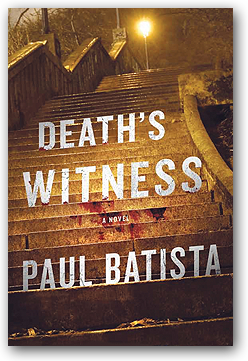 "The verdict on Batista's debut legal thriller: Guilty of delivering not only sharp courtroom drama but steamy romantic escapism as well. Vincent Sorrentino, a crackerjack Manhattan DA (not unlike Batista, a commentator on Court TV), is leading the legal team for 14 defendants accused of bribing Congressman Daniel Fonseca, including Selig 'Sy' Klein, owner of a shady trucking empire personally represented by Sorrentino's colleague and friend, Tom Perini, a former Heisman Trophy winner. Tom's murder while running in Central Park shatters his wife and toddler's world and almost lands Fonseca a mistrial. Grieving Julie Perini suffers more shocks as she learns about her husband's secret underworld association connected to the ongoing trial. Batista provides a gripping, if sometimes confusing, insider look into the seamy side of justice and the politics behind criminal shenanigans. The sweet resolution might feel too good to be true, but is still satisfying." "WOW. What a fun drive. Page after page, it was unstoppable. The characters, the detail, the feeling of place, and suspense were addictive. I found myself satisfied with the experience, but wanting more.... Batista's work as a trial lawyer ['a swashbuckling criminal trial lawyer'!] and knowledge of the criminal mind definitely informs this piece of fiction. And that's why I like it. I spend my days working with lawyers, sometimes touching the white-collar criminal world, and he nailed it. I suspect his new release will follow in form.... Great summer reading." "This well-crafted legal thriller has the feel of the real, because it was written by a first-rate lawyer who is also a very good writer." "A spectacular new addition to the legal thriller genre. Fast, smart and exciting, with richly drawn characters and a race-horse pace. Death's Witness is definitely a winner!"